Historically, the Harvard men’s hockey team has been a force to reckon with in its home rink, Bright-Landry Hockey Center. The Crimson hadn’t lost a game to ECAC playoff opponent Dartmouth at home since Nov. 26, 2010. Nevertheless, after the two teams battled it out in their quarterfinal series opener on Friday night, one squad came away with a win—and it wasn’t the hosts. 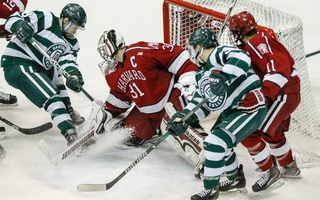 Despite several surges of momentum, Harvard (13-13-4, 11-8-3 ECAC) was simply unable to find a solid offensive footing as the Big Green (16-5-2, 11-10-1) played unflinching defense, anchored by senior net-minder Devin Buffalo. 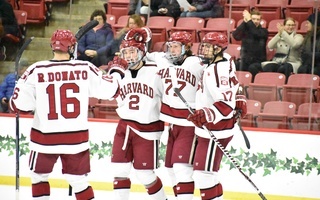 The Crimson’s own defensive errors proved too costly, as Dartmouth jumped out to an early lead that it never relinquished, and the visitors nabbed a 4-1 victory in Game 1 of the series. 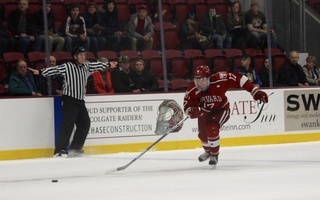 The Crimson and the Big Green are the fourth and fifth seeds in the ECAC tournament, and that small difference gave the former a bye week while the latter took down St. Lawrence in three games in the tournament’s opening round. For Harvard, the week off seems to have been both a blessing and a curse: junior forward Lewis Zerter-Gossage returned to the ice after sitting out the regular season finale against Yale for maintenance issues, but rookie forward Henry Bowlby did not dress against Dartmouth. When asked about Bowlby’s condition, coach Donato declined to comment. “I don’t want to take anything away from the reality that they were more competitive than we were,” said coach Donato when asked if the rest week had adversely affected his team. 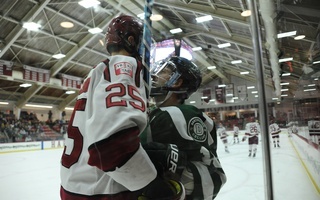 The Big Green carried a 2-0 lead into the second, but until halfway into that middle frame, the game seemed very much within reach for the Crimson. After a slow start, the Harvard icemen had found their legs and were putting pressure on Dartmouth’s defense. But in a burst of offensive-zone time, Big Green junior forward Alex Jasiek found his rookie linemate Matt Baker in the slot. Baker made no mistake, ripping a shot past Crimson tri-captain goaltender Merrick Madsen and widening the gap between the teams to 3-0. It was only much later in the game, as time ticked down in the third period, that Harvard was able to find the net. Madsen had left the ice for an extra skater with more than four minutes to play, making the Crimson’s comeback intentions clear. A left-circle shot from junior forward Ryan Donato skipped through the blue paint, forcing Buffalo to stretch out. For the first time all night, Buffalo could not track the puck as it found sophomore forward Nathan Krusko at the other circle. With the goalie down, Krusko easily slotted it past him, bringing the score to 3-1. Krusko’s tally broke Buffalo’s 57-minute shutout—had the Big Green held Harvard off for the entire game, it would have been the team’s first shutout win against the Crimson since Feb. 9, 2001. After the faceoff at center ice, Harvard pulled Madsen again, but the same trick would not work twice. Dartmouth alternate captain Corey Kalk put the game away with an empty-netter. The teams traded penalties throughout the game, but neither could capitalize. For the Big Green, a team that’s sitting on a 12.1 percent power play efficiency and has come to rely on even-strength scoring instead, that was perhaps less of an issue. 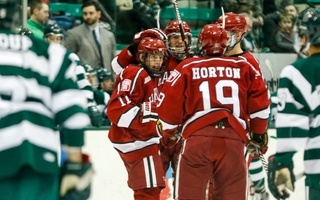 The Crimson has had bursts of power play success and failure, but in recent weeks has upped its season-long conversion rate to 19.3 percent. Despite extended offensive zone time and a 5-on-3 thanks to Dartmouth's back-to-back too- many-men penalties, Harvard was unable to find twine. Madsen, who started his 13th postseason game in net for the Crimson, began the game with an acrobatic series of saves but a hard angle shot from sophomore Cam Strong squeaked by him to give the Big Green the lead. Though his numbers (3.22 GAA, .850 SV%) might suggest otherwise, Madsen did not look shaky on Friday night, aside from that first goal. At the other end of the ice, Buffalo was in control, helped in part by his team’s shot-blocking—while the goalie turned away 34 of Harvard’s 35 shots, Dartmouth also blocked 27 of the Crimson’s attempts. For Harvard, which has often been frustrated by defense despite its shot volume this season, this is a story the team will not want to repeat any more. For the first time since last season’s ECAC semifinals, the Crimson faces a must-win game if it wants to push ahead in the tournament. With the season on the line, Harvard will have to leave it all on the ice on Saturday.